The Bronze Star Medal is a 1 ½ inch in circumscribing width star made of Bronze. Overlaid in the middle of the star is a 3/16-inch wide bronze star. All rays of both stars come together at their center line. "HEROIC OR MERITORIOUS ACHIEVEMENT" is engraved on the reverse side. There is a space available for the recipient’s name to be engraved. A rounded corner, rectangular metal loop holds the star on the ribbon. The ribbon for the Bronze Star has seven stripes and is 1 3/8 inches wide. The first stripe is a White stripe of 1/32 inches. The second is Scarlet and 9/16 inches. The third is white and 1/32 inches, next in the center is a stripe of Ultramarine Blue and 1/8 inch. A White, 1/32 inch stripe is next, followed by a Scarlet, 9/16 inch stripe and a White 1/32 inch stripe. 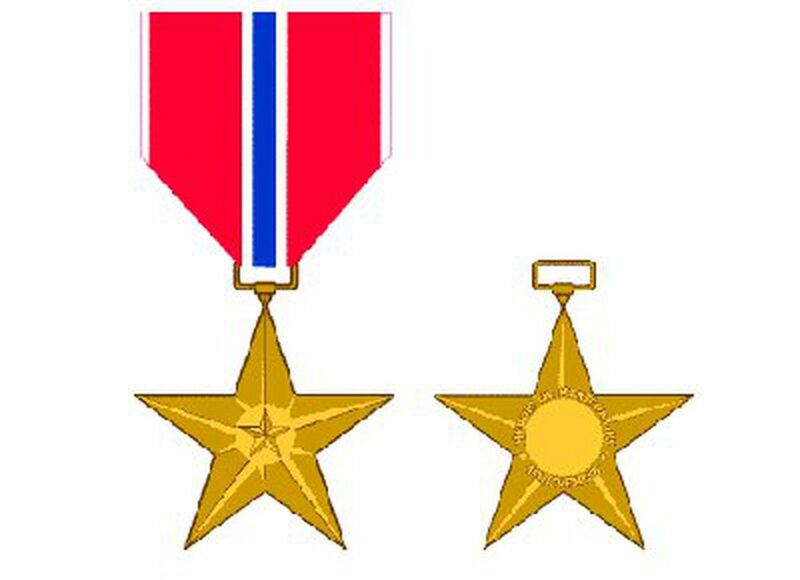 While of a lesser degree than the award of the Legion of Merit, the act justifying the awarding of the Bronze Star Medal must have been praiseworthy and accomplished with merit. It can be awarded for a single act of value or meritorious service. The Bronze Star with "V" is awarded fro valor or bravery during combat actions against an enemy force. It is the fourth highest award for military combat bravery. President Roosevelt received a memorandum from General George C. Marshall, dated 3 February 1944, stating that: "The fact that the ground troops, Infantry in particular, lead miserable lives of extreme discomfort and are the ones who must close in personal combat with the enemy, makes the maintenance of their morale of great importance. The award of the Air Medal have had an adverse reaction on the ground troops, particularly the Infantry Riflemen who are now suffering the heaviest losses, air or ground, in the Army, and enduring the greatest hardships." Two years earlier, the Air Medal had been created to raise the morals of airmen. In turn, the ground troops in Infantry were eligible to wear the Bronze Star had they endured combat action during their time in the World War Two theater of operations. In an announcement in the War Department Bulletin No. 3, dated 10 February 1944, President Roosevelt gave by Executive Order 9419 dated 4 February 1944, retroactive to 7 December 1941, the authorization for the Bronze Star Medal. President Kennedy, per Executive Order 11046 dated 24 August 1962, amended the Executive Order to also include individuals serving with friendly military forces. Per a study done in 1947, the guideline was put into action that gave the retroactive award of the Bronze Star Medal to those who had been awarded the Combat Infantryman Badge or the Combat Medical Badge during World War II. The decision for this action was based on the fact that the badges were awarded only to soldiers that had suffered the hardships which had produced the support of the Bronze Star Medal by General Marshall. Both of these badges required approval by the commander and a citation in orders. The Bronze Star Medal may be awarded for the following services: Meritorious Service in a combat zone (not necessarily combat action), an heroic achievement, or heroic service during combat operations against an enemy. Civilians are also authorized earning the Bronze Star as well. A photo journalist during Vietnam, Joe Galloway, was awarded the Bronze Star with V for valor for rescuing a badly injured soldier during a battle in 1965 when he was reporting for the United Press International (UPI) News.